For many Americans, it is their dream to one day be their own boss and become the owner of their own small business. Entrepreneurs across the country start approximately 409,000 new businesses each month, according to the U.S. Small Business Administration (SBA). Small businesses are essential to the overall economy. Small business account for about 54% of all sales in the U.S.
About 75% of all U.S. businesses are non-employer businesses, meaning one-person operations with no paid employees. 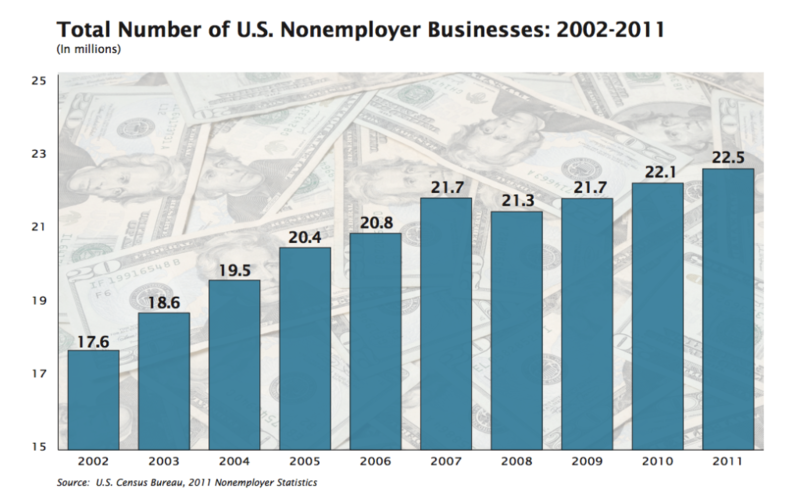 As you can see below, the number of non-employer businesses has steadily increased over the past decade. Whether a side job (“moonlighting” gig) with no employees or a full-time enterprise with 499, successfully running a small business is no easy task. Starting your own small business can be an incredibly rewarding endeavor, allowing you to be your own boss, pursue a passion, and save for retirement. However, small business ownership is a risky proposition, and the best business ideas in the world can flounder without proper execution from company leadership – you. Before starting a business, take an honest look at yourself and decide whether or not you’re cut out for entrepreneurship. What am I risking by starting a business? Am I passionate about my product or service? Am I knowledgeable about my product or service? Could I consider myself an expert? Ideally, how long would I want to be in this industry or taking on this endeavor? The next 5 years? The rest of my life? Am I willing to take on the responsibility of owning a business? Do I have help to start my business? Financial and emotional support; family help? What will I need to sacrifice to start a business? Money and other assets/resources? Time with family? If things don’t go so well, how different will life be before starting the business? Do I have another career to fall back on to support my family and myself? Try these aptitude tests and quizzes to see if you’re cut out for entrepreneurship and ready to start a small business. These are subjective tests, meaning answers are not definitive, and so you may want to take several. Take the Entrepreneurial Aptitude Test to find out if you have the makings of a successful entrepreneur in your DNA. The Kauffman FastTrac test measures whether you have the traits to start your own business. The FunEducation Business Management Aptitude Test can help you learn if you have the “right stuff” for a career in business management. Certain personality types are better suited to entrepreneurship. Learn your personality type by taking the Myers Briggs Type Indicator, the most well-known and respected personality test, or a free alternative. Find your aptitude for self-employment by taking this test from the Knowledge Institute. Determine your entrepreneurial aptitude through a thorough, 70-question aptitude test from OneMoreCustomer, a small business advocacy and education group. Do you have the character traits of an entrepreneur? Answer how you would react to these common situations to find out. Why is this unique within your industry? What void does it fill? What products or services do you plan to develop for the future? Competitive Analysis: List who your competitors are and in what ways your companies will be in competitions. Detail the strengths and weaknesses of your competition. What will your business offer that the competition does not? How does this give your business a leg up? Outline your strategies for besting the competition. Customer Analysis: Answer this very important question – who will be buying your product or paying for your services? Marketing Plan: “If you build it, they will come” is most often not a successful marketing plan. Create a strategy for how you will reach your target customer. How will you get the word out about your business, and the products or services it offers? Operations Plan: Once you’ve started your business, you will need to run it, and have a plan for doing so. The operations plan will detail the logistics of managing the company on a day-to-day, quarterly, and/or yearly basis. It will also include operational milestones you hope to achieve – how much product do you want to move in 5 years? How will you get there? Management Plan: Unless you are running a non-employer business, you will need a management team to help run your company. Detail who is on your current team. Discuss any hiring that will need to be made. Who do you want to hire? Where will you find them? Financial Plan: At the end of the day, the purpose of a business is to make money. Get into the details of your company’s projected finances. Forecast revenues and profits for the short- and long-term. To reach your targets, will you need additional funding from loans or investors? How much will you need? Where do you anticipate it coming from? What else will you need to reach these targets? Will you need to expand the business by hiring more people? Offer more services or products? Buy new assets? The U.S. Small Business Administration has numerous resources to help write your business plan. Read their articles, take an online course, or use their step-by-step Business Plan Tool. Entrepreneur Magazine’s in-depth Business Plan Guide will help walk you through the steps of writing a successful business plan, and suggests business plan software and how-to books. Answering these 20 questions can help shape your business and guide the writing of your business plan. When writing your business plan, be sure to avoid these 4 Common Mistakes. Check out over 500 example business plans for everything including bars, bakeries, beauty salons, and bed and breakfasts. Use an array of business planning templates to do everything from project sales, create a marketing budget, and start a balance sheet. Find over 600 resources for creating your business plan, including sample templates and suggested strategies, at the Center for Business Planning. There are several different kinds of business structures. We will cover what they are and what kinds of businesses take that particular legal structure. A partnership is a single business owned by two or more owners. – To learn more about the rules and requirements of starting and operating a cooperative, see this government guide on How to Start a Cooperative. – For in-depth resources on choosing your business structure, refer to this guide from Entrepreneur Magazine. – Every state is different. Learn your state’s unique filing requirements. If you are searching for a business location, such as an office, storefront, or warehouse, determine what you will need the space to do for your business when deciding on where to set up shop. What location (what kind of neighborhood, what kind of building) will be attractive to customers and clients? Are you planning on growing? Will this space accommodate growth, or will you have to begin the search all over again? How much can you afford to most likely rent, or possibly buy? What unique needs does your business or industry have? How do these need to be reflected in your business location? Who are your ideal neighbors? What is your budget for costs to outfit, renovate, and then maintain the location? Is the rent within my budget? Will your customers and clients want to go there? Is the location in a safe area for you, your employees, and your customers? Labor – will there be people in the area to hire? Your employees – when you hire them, will it be easy for them to get to work? Do you have competition in the area? Can the market sustain both your businesses, or just one? Will this space accommodate growth? Ideally, how long would you want your business to occupy this space? Zoning – are there restrictions on what kinds of businesses can operate here, or restrictions on how you can conduct your business there? How much work will need to be done to get the location ready for business? Will technology need to upgraded, or put in entirely? Does the space need to renovated, outfitted, or equipped in any way? When beginning the search or weighing locations, the best resource for helping you in your decision may be your peers. Many of the 28 million small businesses in the United States have created local and national small business associations. These peer groups share tips and discuss issues affecting small businesses, such as finding a business location. – Most cities and towns have local small business association chapters. Ask other business owners, or search online to find one in your area. – There are several national small business associations. These associations offer members access to resources covering every area of small business ownership. Some may have local chapters in your area. In many cases, you will want (or be required to) register your “Doing Business As” (DBA) name. Your DBA name is a fictitious name that is different than your personal name (though your personal name can be included in it). When you form a business, your legal name is used as the business name until you register a DBA name. Usually, your business name is registered when you register your business, as it is required on all forms and applications. Does My Business Need a Business Name? For sole proprietorships and partnerships, a business name is not required. Using your legal name is fine. However, if you want to use a DBA, you will need to register it. Corporations and LLCs are required in many states to have a business name (which may be as simple as Your Name, LLC) and must register them. Most states require that businesses register their DBA names, although some do not. Check local commerce websites or ask your local small business association to find out where you need to register. When starting a business, one of the most important (and time-consuming, and complicated) requirements you will need to manage is your taxes. The first step to staying on top of your taxes is to get your tax identification number, formally known as your Employer Identification Number (EIN) . Your EIN is a nine-digit number assigned by the IRS that is used to identify what kinds of taxes your business owes. Getting Your EIN: Apply online for your EIN. Once your application is complete, you can get your EIN immediately. Read the IRS’s guide to Understanding Your EIN. For more information on tax identification numbers, including what to do if you misplace your EIN or need to close your account, see the SBA’s information on obtaining your federal business tax ID. Your EIN helps pay taxes at the federal level; however, small businesses may also be subject to state and local taxes. These taxes vary by state, county, and even city, so it is important to do your research and know what taxes will apply. This is also an important consideration when deciding on your business location. State Taxes: The Small Business Administration has collected the links you’ll need to register your business and pay taxes in whichever state you choose to operate in. Local Taxes: Almost all cities and towns tax businesses for the privilege of doing business within their communities. Visit the business section of your city or town’s website to learn what local taxes your small business may be subject to. State and local licenses and permits vary greatly by type of business and municipality. To learn what businesses and permits your business will need, use the SBA’s Permit Me tool to begin the process. Simply enter your zip code and type of business to begin searching. There are many resources and programs available to help businesses get off the ground. Resources may be available for companies that qualify as microbusinesses. Look for a local organization similar to the Microbusiness Advancement Center of Southern Arizona in your area. “Going green” is becoming more and more common as small businesses seek to have environmentally friendly and/or sustainable business practices. Learn more about how your business can become certified green, and the many loans and grants available to green businesses. The old saying “you have to spend money to make money” holds especially true when starting your own business. To know much seed money (or startup money) you will need to start your business, you will need to estimate your costs. Which costs are optional – can you save money on these expenses by going without them or looking at cheaper alternatives? We’ll give a brief overview of financial statements and their components. For a more in-depth look at financial statements, read the SBA’s guide to Preparing Financial Statements. There are two main financial statements used by businesses around the world: the balance sheet and the income statement. The bottom line of the balance sheet gives the best look at a company’s finances: Assets + Liabilities = Net Worth. The income statement shows earnings and expenses over a period of time; it shows how much money is coming in, and how much is going out. Something financial statements may not make as clear, but that is crucial to running a business, is cash flow. Cash flow is money coming in to your business and going out from it. To make payments on time to employees, lenders, and suppliers, your company will need money in its bank account, and that is why analyzing cash flow is so important to staying in business. The goal of every business endeavor is to make a profit, or to earn more money than you spend. Many small businesses will lose money before making a profit – after all, those startup costs come before any money can be made. For instance, say you run a business selling homemade barbeque sauce. With these costs and prices, you would need to sell 100 units a month to break even. Use this Breakeven Analysis Tool from Harvard Business School to find your breakeven point. Startup costs can be expensive, and business owners may not have the money on hand to pay for all costs up front. Additionally, businesses may need more money to expand and purchase new assets, or may need some money to pay employees during a project while waiting on the big payday at the end. To help with these costs, small businesses can apply for financing. – Read this article to learn more about the pros and cons of debt and equity financing. Within the main groups of equity and debt financing, there are several different avenues small businesses can take to receive financing. The U.S. Small Business Administration offers a variety of loan programs for small businesses, including microloans (small, short-term loans) and disaster loans for businesses affected natural disasters. Check with your local bank or credit union to see their small business loan options and if your business qualifies. An early decision small business owners will have to make is choosing a bank, both to deposit money and to take out loans. Are there any fees associated with making bank transactions? Is there a minimum to how much you have to have deposited in your account? What is the bank’s ability to make loans? How much can they loan your business? Does the bank make federally subsidized loans through the Small Business Administration loan system? Can the bank offer a corporate credit card? Do you prefer to work with a national bank, which may have higher loan limits? Or do you prefer to work with a smaller, local bank, which may be able to offer more customer assistance and flexibility? Read more about choosing a bank in this Wall Street Journal guide, How to Shop for a Bank. Check out the FDIC’s Banking Tips for Small Companies. For small loans or when obtaining traditional lending is difficult or not an option, some business owners may borrow funds from their friends and family. These arrangements can be greatly beneficial for both parties, but if not done properly, can be a significant strain on personal relationships. Is this simply a loan, or can the lender have a stake in the company? Along those lines, how much say will the lender have in company decisions? Some or none at all? Keep in mind these 6 Tips for Borrowing Startup Funds from Friends or Family. Get advice from the Wall Street Journal on How to Borrow from Family and Friends. It can be tricky keeping loans from family and friends strictly business. Learn how to navigate this situation successfully. Read Inc. Magazine’s thorough guide on How to Finance a Business With Your 401(k). Be sure to consider The Risks of Tapping Your Retirement Fund for an Alternative Use, such as funding a small business. Read these stories from business owners who used retirement savings to fund their businesses. Learn more about the risks and potential rewards. Many credit card companies offer credit cards specifically for small businesses, with special rates, credit limits, and features. Read our guides to Credit Cards and Credit Management to learn what credit cards are, how they work, and how to develop healthy credit habits. Government funds are allocated for programs that help small businesses train their employees. These funds can be available as grants or tax deductions, helping businesses save money on developing their workforce. 1. Obtain your federal tax ID. 2.Determine your federal and state tax obligations. Spend some time on the IRS website to learn more about deducting business expenses, and which deductions your business may be able to take. 4. Determine when your tax year starts. A tax year is your business’s annual accounting period for income and expenses. Sometimes, your tax year follows the calendar year and begins on January 1; in other cases, you may start your tax year on a different date. Learn more about determining when your tax year starts. IRS e-file – Small business owners who have prepared their taxes can file them directly to the IRS with electronic filing and payment options. TurboTax – TurboTax helps business owners prepare and file their taxes, and offers separate services for sole proprietors or contractors and corporations, partnerships, and LLCs. H&R Block – In addition to online preparation and e-filing, H&R Block users can consult with tax experts at H&R Block locations across the country. TaxACT – TaxACT is another online preparation and e-file option for small business owners, and offers a free trial of their software. Jackson Hewitt Online – Jackson Hewitt Tax Service offers an online preparation and filing options for business owners and the self-employed that comes with unlimited online chat and email support. Social Security Taxes: Employers must match the tax their employees pay to Social Security, which is 6.2% of income. If self-employed, you are taxed at double the rate, 12.4%, because you have to pay the employee tax and the employer’s match. Unemployment Insurance: Some businesses with employees may be required to pay taxes for unemployment insurance, which offers benefits to employees who find themselves out of work through no fault of their own (such as when their employer goes out of business). Visit your state’s website to see if you are required to pay unemployment insurance tax. Workers’ Compensation: Most states require businesses with employees to have workers’ compensation insurance, which protects workers if they get injured on the job. Contact your state’s labor office to find out if your business is required to carry workers’ compensation insurance. The following are employee benefits that some employers choose to offer. Providing employees with these optional benefits can be a competitive advantage in hiring employees, creating a better work environment, and enticing good employees to stay in their jobs. Many well-known organizations have their own employee incentive programs. Here are some examples of their successful and creative incentive programs.